Scott McLaughlin qualified on Armor All Pole Position for the Vodafone Gold Coast 600 opener after provisional pole-sitter Shane van Gisbergen triggered a kerb hop. The Shell V-Power Racing pilot put pressure on the three men who followed him by clocking a 1:10.3744s in the #17 FGX Falcon, 0.1454s faster than his best effort in the earlier 20-minute session. David Reynolds (#9 Erebus Penrite ZB Commodore) was the next driver on track but was chasing the Kiwi through the first and second sectors before he broke into a small slide at the final sequence of corners and came up two tenths slower. Jamie Whincup split them when he pipped Reynolds by just 0.0014s in the #1 Red Bull HRT ZB Commodore, despite not setting any of the fastest sectors. Van Gisbergen was last man onto the Surfers Paradise Street Circuit in the sister #97 ZB Commodore but hopped at the Beach Chicane and will start in the fifth row of the grid alongside James Courtney (#25 Boost Mobile ZB Commodore), who committed the same offence having already missed the apex at the Turn 4 Hairpin. The latter had provisionally qualified fifth, meaning he was the other major mover in the session, albeit in the wrong direction. “Just pushed too much,” explained van Gisbergen. “It’s a shame, the first sector I mucked up and was just trying to make it back. McLaughlin, on the other hand, qualified on pole for the 12th time this season and 45th in his career, and securing a second straight Armor All Pole Champion award and extra $10,000 in the process. “Great for everyone at Shell V-Power Racing,” he said. “We had two good cars today and I felt like we could have done it in Qualifying; just didn’t get the lap together. “To do it in the Shootout is even better, it’s fantastic. Fabian Coulthard will start from the outside of the second row after he swiped both mirrors but appeared to not put any other marks on the #12 DJR Team Penske FGX Falcon. Up to an including Coulthard, the session had progressed as predicted by provisional qualifying, with each driver faster than the previous. Chaz Mostert (#55 Supercheap Auto FGX Falcon) and Michael Caruso (#23 Industrial Athlete Nissan Altima) start from Row 3, while the two cars behind both got away with contact. Nick Percat bumped the wall at Turn 13 in the #8 Alliance Truck Parts ZB Commodore on his way to seventh, while Cameron Waters swiped the tyres exiting the Front Chicane as he qualified eighth in the #6 Monster Energy FGX Falcon. 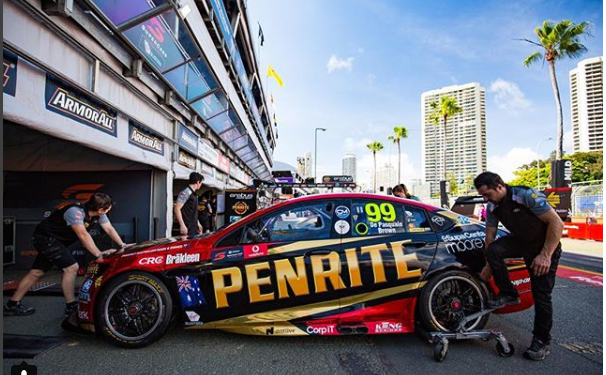 Race 26 (102 laps) starts at 1425 local time/1525 AEDT.